And sponsor Nissan got to take their new Micra home! 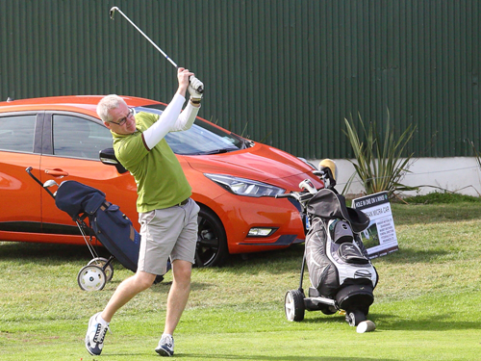 Last Friday in Woodbrook Golf Club turned out to be a great day for our 2018 Annual Maurice Ledwidge Memorial Golf Classic. The rain stayed away, over 40 teams entered, with some great scoring, and our winners took the cup by just one shot with a fine score of 93. (for the Nissan Micra) No winner! A big thanks to our main sponsor on the day, Massey Brothers Funeral Home and to our other business partners – FitzGerald Flynn Insurances, Windsor Deansgrange, uhlsport – all of whom helped make the day the fine spectacle that it was. Thanks also to The ‘Noggin Inn for acting as our nineteenth hole and to tournament hosts Woodbrook Golf Club for the other eighteen. We thank everyone who helped make it a memorable day out once more and we look forward to seeing you all again next year where we hope we’ll have even a better event! Do enjoy a few more photos of the day or view them in the slideshow below. Certainly one for the memories, with great burgers too!